Smart String – A Better Measuring Tape? | OhGizmo! Win A TimeCommand From Stem Innovation! Smart String – A Better Measuring Tape? What looks like a low-rent calculator is actually a vast improvement to the traditional tape measure. 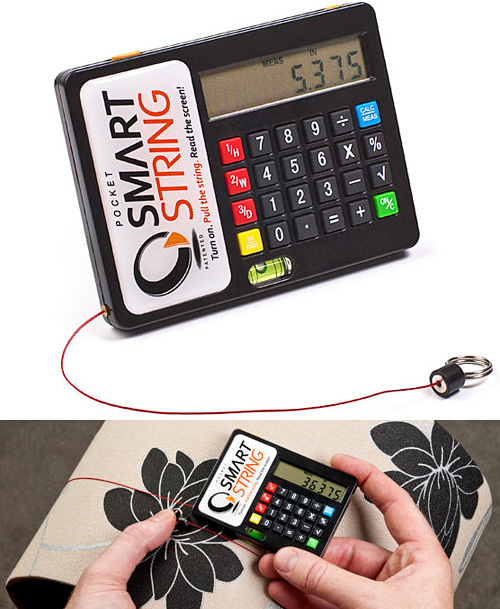 The Smart String, aptly named given the retractable metal tape has been replaced with 50 feet of 20 pound strength string, works just like a traditional model, but with some notable improvements. For one, the string can be easily wrapped around irregularly shaped objects. So determining the circumference of a beachball, a task I’m sure we all deal with on a daily basis, is made much easier. The actual measured distance is automatically displayed on the screen as well, to 3 decimal places of accuracy. So you don’t have to count out little tick marks on the tape, not that that’s even possible with this design. Like any good multi-tasker it’s got a built-in calculator that lets you recall and crunch any 3 measurements stored in its memory. There’s even a level bubble on the bottom edge plus a flashlight, which for just $11.99 from ThinkGeek, is above and beyond the tool call of duty. ← Win A TimeCommand From Stem Innovation!